Signing of MOU with BSF. 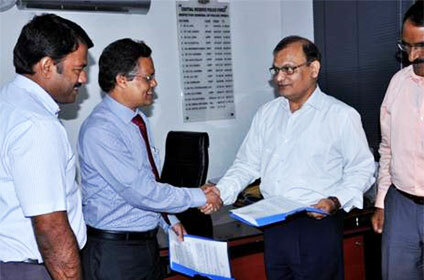 An MOU was signed between BPCL and BSF on 05.06.2015 for the period 01.04.2015 to 31.03.2016. On the similar lines as in the case of CRPF, we are vigorously following up with the office of BSF for increasing our share in supplies to BSF. Signing of MOU with CRPF. An MOU was signed between BPCL and CRPF on 03.06.2015 for the period starting from 03.06.2015 to 31.03.2016. As a result of this MOU and our continuous endeavor to increase our share in respect of overall supplies to CRPF, a supply order with a growth of approx 900% was received for the quarter of July-Sept 15. Additionally CRPF offered 10 new KSPs to BPCL for commissioning. Photograph taken at the time of signing of MOU has been attached. Commissioning of Varanasi RCD in record time. RCD Varanasi was commissioned on 20.06.2015 in a record time of nineteen days and is presently doing an average sale of 15 KL HSD a day. Commissioning of this RCD was a result of closely integrated team efforts of Delhi territory in coordination with Retail. Photographs taken at the time of commissioning have been attached. OGCF 2015 at M/s.National Engineering Industries Ltd.
Oil and Gas Conservation Fortnight 2015 is being celebrated with great enthusiasm by I&C team Jaipur. As part of this initiative a 'Technical Seminar’ was conducted in the premises of M/S National Engineering Industries Limited, Jaipur which was attended by thirty five participants. M/S NEI assumes heightened significance for Jaipur territory as it is the sole customer taking MTO, a high margin product. During the main session, conducted by Shri Venugopal, Deputy Manager, Technical Services, NR important tips pertaining to a wide aaray of conservation topics were covered. Based on a special request from Shri Sumit Agarwal, Deputy General Manager-Maintenance (I/C) of the plant, issues pertaining to safety and proper decantation of tank lorries were also covered. The session, which was interactive throughout, was followed by a 'Question-Answer' forum in which the entire panel from team Jaipur, including MMC, Shri APS Malhotra and Area Manager, Shri Parivesh Batham participated. The effort was highly appreciated by all participants who requested that similar programs be conducted by BPCL in future as well. Till the year 2010, BPCL had no presence in the lucrative HSD business of NWR. However, in a matter of just five years, the situation has changed beyond imagination, with a respectable sale of approximately 1600 KL per month and two state of the art RDIs at Churu and Lalgarh. Now, the territory is poised for some interesting breakthroughs in the near future. To cement the relationship and take it to the next level, Coordination Meet-2015 was organized with precision and enthusiasm by team Jaipur, in a first such meeting, in history of the territory. The NWR team was packed with its top brass, including, besides others, CME, Mr. Bhushan Patil, CMPE, Mr. RC Meena and Deputy CME, Mr. Hemant Kumar. The territory team was led by Territory Manager, Mr. Harneet Singh and included all members of the team. The meeting proved to be very fruitful, with several new ideas discussed with passion and frankness. It was agreed by both sides to make this an annual feature of the business calendar. Customer Engagement Program at Army Camp at Jodhpur. This Safety program was conceptualized in a meeting with Brigadier ASC Narpat Singh Rajput and ST9 Col A. Kundoo in may 2015. Army requested BPCL to organize a LPG safety program for women and children during the summer Vacations in association with AWWA (army wives welfare association). We as BPCL First Team made it our endeavor to organize an interactive LPG Safety program on Army premises .The seminar would not only impart LPG safety knowledge to army personnel and their families but also help us to establish a long term relationship with the Army. We are looking to unlock the immense untapped business potential for Lubes and I&C. Event was a success and everyone appreciated the efforts made by Bharat Petroleum and the concern shown by whole team of Safety of individuals. Real excitement part was quiz where everyone had participated with full energy and enthusiasm. Army officials also appreciated the event and have promised us for continued relationship in business. We were also able to find coverage in Dainik Bhaskar (Jodhpur Page). Bhubaneswar I&C Territory had carried out the following communication activities during 2014-15. Oil Conservation Fortnight Activities at customer premises were carried out where The customers were briefed on the current oil gas scenario and the need to conserve fuel. Various oil conservation tips were shared with the customers followed by taking the Oil Conservation Pledge by the participants. Technical Seminar was done at SAIL Rourkela Steel Plant along with TC, Retail Sambalpur Territory who was earlier in deputation to PCRA. BPCL Customer Foundation Day was celebrated with customers/vendors at BPCL office / customer premises. Direct Customer Meets were held with customers covering not only I&C related matter but also on Automation; Q&Q and visit to our Retail Outlets for a firsthand experience. Played the pivotal anchor role in all BPCL First Related Activities in conjunction with all other BUs. 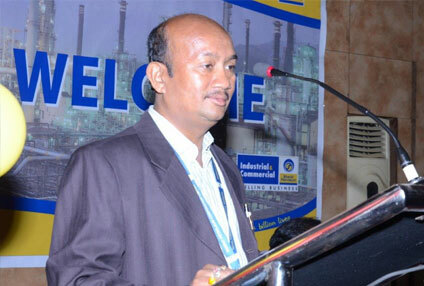 During 2015-16, in addition to the above mentioned activities Bhubaneswar I&C Territory plans to take part along with Lubes SBU in local Industrial Trade Fairs / Exhibitions with the objective of propagating the BPCL Brand Values and also by educating the larger community on the different products being handled by BPCL. A few write-ups which have appeared in Intranet along with photographs are attached for your kind perusal. BPCL First Bhubaneswar: Direct Customers' Day Out. An Industrial Direct Customer Meet was conducted in Bhubaneswar on 17th January 2015 covering the subjects of – Oil Conservation; Automation, Quality Control, Safety; DBTL and visit to BPCL Retail Outlet. The program was inaugurated by TM (I&C) Bhubaneswar who while welcoming the participants gave an overview of BPCL activities over the years and laid emphasis on BPCL customer centric approach in all our activities. The customers were briefed on the current oil gas scenario and the need to conserve fuel. Various oil conservation tips were shared with the forum followed by taking the Oil Conservation Pledge by the participants. A quiz on Oil & Gas Conservation was conducted at the session. An illuminating session on Quality Control was conducted by Quality Assurance Executive who laid emphasis on the correct procedure of taking samples and checking of the various quality parameters of petroleum products which was highly appreciated by the direct customers. Thereafter, Assistant Manager Retail Automation showed and demonstrated to the direct industrial customers the benefits of Automation for the motorists followed by a visit to nearby BPCL RO – BP Bhubaneswar. The direct customers were widely touched by the interaction put up by BPCL Officials and all their queries were successfully addressed. The Direct customers are now much more aware about the unified face of various offerings form BPCL, which includes: Retail Automation unique features, MAK Lubricants, BPCL Customer Care System-Toll Free No. etc and such events will definitely enhance BPCL brand image in the minds of the customer in the times to come. Bhubaneswar I&C Territory successfully conducted BPCL Foundation Day celebration and Energy Conservation Campaign on 24.01.15 at Bhubaneswar Territory Office and also at two of our esteemed customers at Bhubaneswar (M/s Backbone Enterprises) and at Rourkela (Hindustan Aqua Ltd). The customers were selected so that the theme for this year’s Foundation Day, Swachh Bharat Abhiyan, could be taken to our industrial customer and to initiate and involve their employees too in this national mission. Secondly, as a part of Oil & Gas Conservation Fortnight 2015, fuel conservation tips can be shared with the customers. The ceremony started with a brief introduction about the company and the customer centric activities conducted by BPCL which was followed by the cake cutting ceremony. Both our Area Managers interacted with the customers regarding the need for energy conservation, energy outlook and the steps to be taken in Industrial Sector as well as in our personal lives from home to daily transportation to save energy. They also spoke about the Swachh Bharat Abhiyan and its importance. The customers also took the Oil Conservation Pledge and committed themselves to practice the same in their daily life. 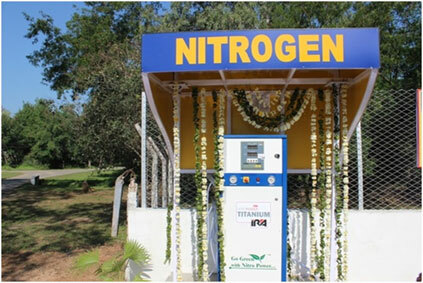 First Fully Automated Consumer Pump with Low cost canopy by I&C at Bhopal. The renovated consumer pump was inaugurated by Shri Tejaswi Nayak, Municipal Commissioner & Shri S K Malik GM Sales (I&C) in presence of Bhopal BPCL First team. The Municipal Commissioner has appreciated the efforts put in by BPCL and has shown keen interest in giving 5 places in Bhopal to BPCL for developing Retail Outlets to be operated by BMC. This initiative of BPCL will strengthen our relationship with Bhopal Municipal Corporation and will go long way in strengthening our brand and maximising business in Bhopal. This is the first Major initiative under BPCL FIRST by Bhopal Team which in days to come will not only strengthen our brand but will also maximise our MS / HSD/ LUB business. Another first by BPC for the Indian Army. BPC is the first OMC to commission the KSP for Indian Army with Nitrogen filling facility .The KSP was inaugurated by Lt. General Alok Clare GOC ,31 Armored division on 19th March 2015 in presence of Manoj Menon , TM(I&C), Bhopal . 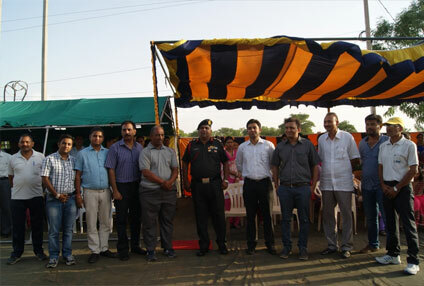 The program was attended by Officer commanding of various units of Jhansi & Babina cantonment. The new KSP with Nitrogen facilities was also appreciated by Core Commander (21 core) and has advised Brigadier ASC to have similar facilities from BPCL in other Army Locations. This initiative of BPCL will strengthen our relationship with Indian Army and will go long way in maximising our business with the Army. Brigadier ASC, to start with, has requested BPC for putting similar facilities at their units in Babina/ Gwalior / Bairagarh. Launch of Bio Diesel in RCD-Secunderabad I&C Territory. 5th of June'15, the World Environment day, was celebrated in a special way by SC Railways and BPCL I & C Territory Sec’bad by launching Bio Diesel for Locomotives. On this day South Central Rly & BPCL launched Bio Diesel blended HSD at Sanatnagar RCD where in HSD is blended with 5 % B100 to make B5 HSD and issued to the Locomotives. This is the first RCD among OMC’s to start this pilot project. BPCL has provided storage & blending facility in the RCD itself , and Railways are procuring B100 from a 3rd party and blending to make B5. The expenditure of Indian Railways on diesel fuel (HSD) is approximately 18% of their total operating cost. In view of the significance that diesel fuel has for the railways, various fuel management strategies are being explored by Indian Railways with the aim to reduce operating cost, enhance service performance, increase economic competitiveness and reduce carbon release into the environmental. Thus Railways have decided to use HSD with 5% bio-diesel in their diesel locomotives. 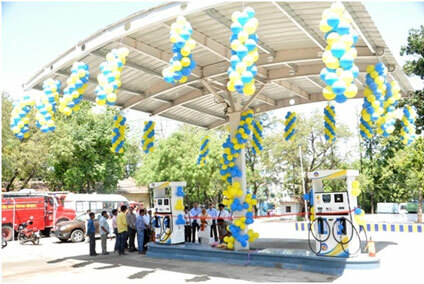 The facilities were inaugurated by Sh.Umesh Singh AGM SC Rly in the presence of BPCL and Railway officials. 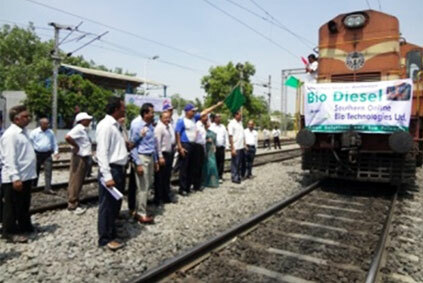 The 1st locomotive was fuelled with Bio Diesel B5 and flagged off .This event was extensively covered in local print media appreciating the efforts made by Railways and BPCL in protecting the environment. A few photos of the event with the news paper coverage are enclosed for your ref and publications.